This article is about the church building in Jerusalem. For other uses, see Holy Sepulchre (disambiguation). The Church of the Holy Sepulchre[b] (Arabic: كَنِيسَةُ ٱلْقِيَامَة‎ Kanīsatu al-Qiyāmah; Greek: Ναὸς τῆς Ἀναστάσεως Naos tes Anastaseos; Armenian: Սուրբ Հարության տաճար Surb Harut'yan tač̣ar; Latin: Ecclesia Sancti Sepulchri; Hebrew: כנסיית הקבר‎, Knesiyat ha-Kever; also called the Church of the Resurrection or Church of the Anastasis by Orthodox Christians) is a church in the Christian Quarter of the Old City of Jerusalem. The church contains, according to traditions dating back to at least the fourth century, the two holiest sites in Christianity: the site where Jesus of Nazareth was crucified, at a place known as "Calvary" or "Golgotha", and Jesus' empty tomb, where he is said to have been buried and resurrected. The tomb is enclosed by an 19th-century shrine called the Aedicula. [c] The Status Quo, a 260-year-old understanding between religious communities, applies to the site. Within the church proper are the last four (or, by some definitions, five) Stations of the Via Dolorosa, representing the final episodes of Jesus' Passion. The church has been a major Christian pilgrimage destination since its creation in the fourth century, as the traditional site of the Resurrection of Christ, thus its original Greek name, Church of the Anastasis. Today, the wider complex accumulated during the centuries around the Church of the Holy Sepulchre also serves as the headquarters of the Greek Orthodox Patriarch of Jerusalem, while control of the church itself is shared among several Christian denominations and secular entities in complicated arrangements essentially unchanged for over 160 years, and some for much longer. The main denominations sharing property over parts of the church are the Roman Catholic, Greek Orthodox and Armenian Apostolic, and to a lesser degree the Coptic Orthodox, Syriac Orthodox and Ethiopian Orthodox. Meanwhile, Protestants have no permanent presence in the Church. Some Protestants prefer the Garden Tomb, elsewhere in Jerusalem, as a more evocative site to commemorate Jesus' crucifixion and resurrection. In 70 AD, the siege of Jerusalem by Emperor Titus saw the destruction of the Second Temple. Sixty years later, in 130 AD, the Roman emperor Hadrian started a Roman colony in Jerusalem, and c. 135, ordered that a cave containing a rock-cut tomb be filled in to create a flat foundation for a temple dedicated to Jupiter or Venus. The temple, usually referred to as Jupiter Capitolinus, remained until the early 4th century. After seeing a vision of a cross in the sky in 312, Constantine the Great converted to Christianity, signed the Edict of Milan legalising the religion, and sent his mother Helena to Jerusalem to look for Christ's tomb. With the help of Bishop of Caesarea Eusebius and Bishop of Jerusalem Macarius, three crosses were found near a tomb, leading the Romans to believe that they had found Calvary. Constantine ordered in about 326 that Jupiter Capitolinus be replaced by a church. After the temple was torn down and its ruins removed, the soil was removed from the cave, revealing a rock-cut tomb that Helena and Macarius identified as the burial site of Jesus. In 327, Constantine and Helena separately commissioned the Church of the Nativity in Bethlehem to commemorate the birth of Jesus. Constantine's church was built as separate constructs over the two holy sites: the great basilica (the Martyrium visited by Egeria in the 380s), an enclosed colonnaded atrium (the Triportico) with the traditional site of Calvary in one corner, and across a courtyard, a rotunda called the Anastasis ("Resurrection"), where Helena and Macarius believed Jesus to have been buried. The church was consecrated on 13 September 335. Every year, the Eastern Orthodox Church celebrates the anniversary of the Dedication of the Temple of the Resurrection of Christ [ru]. This building was destroyed by a fire in May of 614 A.D when the Sassanid Empire, under Khosrau II, invaded Jerusalem and captured the True Cross. In 630, the Emperor Heraclius rebuilt the church after recapturing the city. After Jerusalem came under Arab rule, it remained a Christian church, with the early Muslim rulers protecting the city's Christian sites, prohibiting their destruction or use as living quarters. A story reports that the Caliph Umar ibn al-Khattab visited the church and stopped to pray on the balcony; but at the time of prayer, he turned away from the church and prayed outside. He feared that future generations would misinterpret this gesture, taking it as a pretext to turn the church into a mosque. Eutychius added that Umar wrote a decree prohibiting Muslims from praying at this location. The building suffered severe damage due to an earthquake in 746. Early in the ninth century, another earthquake damaged the dome of the Anastasis. The damage was repaired in 810 by Patriarch Thomas. In the year 841, the church suffered a fire. In 935, the Orthodox Christians prevented the construction of a Muslim mosque adjacent to the Church. In 938, a new fire damaged the inside of the basilica and came close to the rotunda. In 966, due to a defeat of Muslim armies in the region of Syria, a riot broke out, which was followed by reprisals. The basilica was burned again. The doors and roof were burnt, and the Patriarch John VII was murdered. On 18 October 1009, Fatimid caliph Al-Hakim bi-Amr Allah ordered the complete destruction of the church as part of a more general campaign against Christian places of worship in Palestine and Egypt. [d] The damage was extensive, with few parts of the early church remaining, and the roof of the rock-cut tomb damaged. Some partial repairs followed. Christian Europe reacted with shock and expulsions of Jews, serving as an impetus to later Crusades. In wide-ranging negotiations between the Fatimids and the Byzantine Empire in 1027–28, an agreement was reached whereby the new Caliph Ali az-Zahir (Al-Hakim's son) agreed to allow the rebuilding and redecoration of the Church. The rebuilding was finally completed with the financing at a huge expense by Emperor Constantine IX Monomachos and Patriarch Nicephorus of Constantinople in 1048. As a concession, the mosque in Constantinople was re-opened and the khutba sermons were to be pronounced in az-Zahir's name. Muslim sources say a by-product of the agreement was the recanting of Islam by many Christians who had been forced to convert under Al-Hakim's persecutions. In addition, the Byzantines, while releasing 5,000 Muslim prisoners, made demands for the restoration of other churches destroyed by Al-Hakim and the re-establishment of a Patriarch in Jerusalem. Contemporary sources credit the emperor with spending vast sums in an effort to restore the Church of the Holy Sepulchre after this agreement was made. Despite the Byzantines spending vast sums on the project, "a total replacement was far beyond available resources. The new construction was concentrated on the rotunda and its surrounding buildings: the great basilica remained in ruins." The rebuilt church site consisted of "a court open to the sky, with five small chapels attached to it." The chapels were to the east of the court of resurrection, where the wall of the great church had been. They commemorated scenes from the passion, such as the location of the prison of Christ and of his flagellation, and presumably were so placed because of the difficulties of free movement among shrines in the streets of the city. The dedication of these chapels indicates the importance of the pilgrims' devotion to the suffering of Christ. They have been described as 'a sort of Via Dolorosa in miniature'... since little or no rebuilding took place on the site of the great basilica. Western pilgrims to Jerusalem during the eleventh century found much of the sacred site in ruins." Control of Jerusalem, and thereby the Church of the Holy Sepulchre, continued to change hands several times between the Fatimids and the Seljuk Turks (loyal to the Abbasid caliph in Baghdad) until the arrival of the Crusaders in 1099. Many historians maintain that the main concern of Pope Urban II, when calling for the First Crusade, was the threat to Constantinople from the Turkish invasion of Asia Minor in response to the appeal of Byzantine Emperor Alexios I Komnenos. Historians agree that the fate of Jerusalem and thereby the Church of the Holy Sepulchre was of concern if not the immediate goal of papal policy in 1095. The idea of taking Jerusalem gained more focus as the Crusade was underway. The rebuilt church site was taken from the Fatimids (who had recently taken it from the Abassids) by the knights of the First Crusade on 15 July 1099. The First Crusade was envisioned as an armed pilgrimage, and no crusader could consider his journey complete unless he had prayed as a pilgrim at the Holy Sepulchre. Crusader Prince Godfrey of Bouillon, who became the first crusader monarch of Jerusalem, decided not to use the title "king" during his lifetime, and declared himself "Advocatus Sancti Sepulchri" ("Protector [or Defender] of the Holy Sepulchre"). By the crusader period, a cistern under the former basilica was rumoured to have been the location where Helena had found the True Cross, and began to be venerated as such; although the cistern later became the "Chapel of the Invention of the Cross," there is no evidence of the rumour before the 11th century, and modern archaeological investigation has now dated the cistern to 11th century repairs by Monomachos. According to the German clergyman and orient pilgrim Ludolf von Sudheim, the keys of the Chapel of the Holy Sepulchre were in hands of the "ancient Georgians" and the food, alms, candles and oil for lamps were given them by the pilgrims in the south door of the church. William of Tyre, chronicler of the Crusader Kingdom of Jerusalem, reports on the renovation of the Church in the mid-12th century. The crusaders investigated the eastern ruins on the site, occasionally excavating through the rubble, and while attempting to reach the cistern, they discovered part of the original ground level of Hadrian's temple enclosure; they decided to transform this space into a chapel dedicated to Helena (the Chapel of Saint Helena), widening their original excavation tunnel into a proper staircase. The crusaders began to refurnish the church in a Romanesque style and added a bell tower. These renovations unified the small chapels on the site and were completed during the reign of Queen Melisende in 1149, placing all the Holy places under one roof for the first time. The church became the seat of the first Latin Patriarchs, and was also the site of the kingdom's scriptorium. The church was lost to Saladin, along with the rest of the city, in 1187, although the treaty established after the Third Crusade allowed for Christian pilgrims to visit the site. Emperor Frederick II (r. 1220–50) regained the city and the church by treaty in the 13th century while he himself was under a ban of excommunication, with the curious consequence that the holiest church in Christianity was laid under interdict. The church seems to have been largely in Greek Orthodox Patriarch Athanasius II of Jerusalem's hands, c. 1231–47, during the Latin control of Jerusalem. Both city and church were captured by the Khwarezmians in 1244. At least as early as 1555, a marble sheath was placed to envelop the remains of Christ's tomb, containing a limestone burial bed, probably to prevent pilgrims from laying their hands on the original rock or taking small pieces as souvenirs. This remains today. The Franciscan friars renovated it further in 1555, as it had been neglected despite increased numbers of pilgrims. The Franciscans rebuilt the Aedicule ('small building'), extending the structure to create an ante-chamber. After the renovation of 1555, control of the church oscillated between the Franciscans and the Orthodox, depending on which community could obtain a favorable firman from the "Sublime Porte" at a particular time, often through outright bribery, and violent clashes were not uncommon. There was no agreement about this question, although it was discussed at the negotiations to the Treaty of Karlowitz in 1699. In 1767, weary of the squabbling, the "Porte" issued a firman that divided the church among the claimants. A fire severely damaged the structure again in 1808, causing the dome of the Rotunda to collapse and smashing the Aedicule's exterior decoration. The Rotunda and the Aedicule's exterior were rebuilt in 1809–1810 by architect Nikolaos Ch. Komnenos of Mytilene in the then current Ottoman Baroque style. The fire did not reach the interior of the Aedicule, and the marble decoration of the Tomb dates mainly to the 1555 restoration, although the interior of the ante-chamber, now known as the "Chapel of the Angel," was partly rebuilt to a square ground-plan, in place of the previously semi-circular western end. Another decree in 1853 from the sultan solidified the existing territorial division among the communities and set a "Status Quo" for arrangements to "remain forever," causing differences of opinion about upkeep and even minor changes, including disagreement on the removal of the "Immovable Ladder", an exterior ladder under one of the windows; this ladder has remained in the same position since then. The cladding of red marble applied to the Aedicule by Komnenos has deteriorated badly and is detaching from the underlying structure; since 1947 it has been held in place with an exterior scaffolding of iron girders installed by the British authorities. A careful renovation is undergoing, funded by a $4 million gift from King Abdullah II of Jordan and a $1.3-million gift from Mica Ertegun. The current dome, made of iron, was restored by Catholics, Greeks and Turks in 1868. It was restored again between 1994–1997 as part of extensive modern renovations to the church which have been ongoing since 1959. During the 1970–1978 restoration works and excavations inside the building, and under the nearby Muristan, it was found that the area was originally a quarry, from which white meleke limestone was struck. To the east of the Chapel of Saint Helena, the excavators discovered a void containing a 2nd-century drawing of a Roman ship, two low walls which supported the platform of Hadrian's 2nd-century temple, and a higher 4th-century wall built to support Constantine's basilica. After the excavations of the early 1970s, the Armenian authorities converted this archaeological space into the Chapel of Saint Vartan, and created an artificial walkway over the quarry on the north of the chapel, so that the new Chapel could be accessed (by permission) from the Chapel of Saint Helena. In 2016, restoration works were performed in the Aedicule. For the first time since at least 1555, marble cladding which protected the estimated burial bed of Jesus from vandalism and souvenir takers was removed. When the cladding was first removed on 26 October, an initial inspection by the National Technical University of Athens team showed only a layer of fill material underneath. By the night of 28 October, the original limestone burial bed was revealed intact. This suggested that the tomb location has not changed through time and confirmed the existence of the original limestone cave walls within the Aedicule. The tomb was resealed shortly thereafter. The courtyard facing the entrance to the church is known as the parvis. Located around the parvis are a few smaller structures. Broken columns—once forming part of an arcade—stand opposite the church, at the top of a short descending staircase stretching over the entire breadth of the parvis. In the 13th century, the tops of the columns were removed and sent to Mecca by the Khwarezmids. The Gethsemane Metochion, a small Greek Orthodox monastery. The Chapel of St Michael (Coptic/Ethiopian Orthodox), giving access to the roof of the Chapel of St Helen and the Ethiopian monastery. Chapel of the Franks—a blue-domed Roman Catholic Crusader chapel dedicated to Our Lady of Sorrows, which once provided exclusive access to Calvary. The chapel marks the 10th Station of the Cross (the stripping of Jesus' garments). A Greek Orthodox oratory and chapel, directly beneath the Chapel of the Franks, dedicated to St. Mary of Egypt. The tomb of Philip d'Aubigny (Phillipe Daubeney, d. 1236)—a knight, tutor, and royal councilor to King Henry III of England and signer of the Magna Carta—is placed in front of, and between, the two original entrance doors of the church, of which the eastern one is walled-up. It is one of the few tombs of crusaders and other Europeans not removed from the Church after the Muslim recapture of Jerusalem in the 12th century. A stone marker was placed on his tomb in 1925, sheltered by a wooden trapdoor which hides it from view. The Chapel of the Forty Martyrs of Sebaste (Greek Orthodox; at the base of the bell tower). The church's bell tower is located to the left of the façade. It is currently almost half its original size. The entrance to the church, a single door in the south transept—through the crusader façade—is found past a group of streets winding through the outer Via Dolorosa, by way of a local souq in the Muristan. This narrow way of access to such a large structure has proven to be hazardous at times. For example, when a fire broke out in 1840, dozens of pilgrims were trampled to death. The "Immovable Ladder" stands beneath a window on the façade. Historically, two large, arched doors allowed access to the church. However, only the left-hand entrance is currently accessible, as the right door has long since been bricked up. These entrances are located in the parvis of a larger courtyard, or plaza. Just inside the church entrance is a stairway leading up to Calvary (Golgotha), traditionally regarded as the site of Jesus' crucifixion and the most lavishly decorated part of the church. The exit is via another stairway opposite the first, leading down to the ambulatory. Golgotha and its chapels are just south of the main altar of the Catholicon. 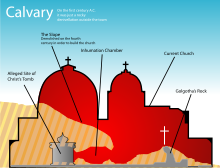 Calvary is split into two chapels, one Greek Orthodox and one Catholic, each with its own altar. 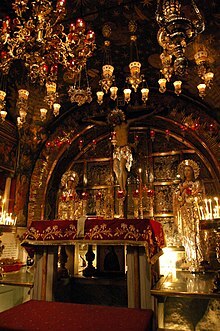 On the left (the north side), the Greek Orthodox chapel's altar is placed over the rock of Calvary (the 12th Station of the Cross), which can be touched through a hole in the floor beneath the altar. The rock can be seen under protective glass on both sides of the altar. The softer surrounding stone was removed when the church was built. The Roman Catholic (Franciscan) Chapel of the Nailing of the Cross (11th Station of the Cross) stretches to the south. Between the Catholic and the Orthodox altar, a statue of Mary with an 18th-century bust marks the 13th Station of the Cross. On the ground floor, just underneath the Golgotha chapel, is the Chapel of Adam. According to tradition, Jesus was crucified over the place where Adam's skull was buried. According to some, the blood of Christ ran down the cross and through the rocks to fill the skull of Adam. Through a window at the back of the 11th-century apse, the rock of Calvary can be seen with a crack traditionally held to be caused by the earthquake that followed Jesus' death, while some scholars claim it to be the result of quarrying against a natural flaw in the rock. Behind the Chapel of Adam, the Museum of the Greek Orthodox Patriarchate, which holds many relics including a 12th-century crystal mitre which is alleged to have once held a fragment of the Holy Cross. Just inside the entrance to the church is the Stone of Anointing (also Stone of the Anointing or Stone of Unction), which tradition believes to be the spot where Jesus' body was prepared for burial by Joseph of Arimathea. However, this tradition is only attested since the crusader era (notably by the Italian Dominican pilgrim Riccoldo da Monte di Croce in 1288), and the present stone was only added in the 1810 reconstruction. The wall was a temporary addition to support the arch above it, which had been weakened after the damage in the 1808 fire; it blocks the view of the rotunda, separates the entrance from the Catholicon, sits on top of the now-empty and desecrated graves of four 12th-century crusader kings—including Godfrey of Bouillon and Baldwin I of Jerusalem—and is no longer structurally necessary. There is a difference of opinion as to whether it is to be seen as the 13th Station of the Cross, which others identify as the lowering of Jesus from the cross and locate between the 11th and 12th stations on Calvary. The lamps that hang over the Stone of Unction, adorned with cross-bearing chain links, are contributed by Armenians, Copts, Greeks and Latins. Immediately to the left of the entrance is a bench that has traditionally been used by the church's Muslim doorkeepers, along with some Christian clergy, as well as electrical wiring. To the right of the entrance is a wall along the ambulatory containing, to the very right, the staircase leading to Golgotha. Further along the same wall is the entrance to the Chapel of Adam. The rotunda is located in the centre of the Anastasis, beneath the larger of the church's two domes. In the centre of the rotunda is a small chapel called the Kouvouklion in Greek[e] or the Aedicula in Latin,[c] which encloses the Holy Sepulchre. The Aedicule has two rooms, the first holding the Angel's Stone, which is believed to be a fragment of the large stone that sealed the tomb; the second is the tomb itself. Possibly due to the fact that pilgrims laid their hands on the tomb or to prevent eager pilgrims from removing bits of the original rock as souvenirs, a marble plaque was placed in the fourteenth century on the tomb to prevent further damage to the tomb. Under the Status Quo, the Eastern Orthodox, Roman Catholic, and Armenian Apostolic Churches all have rights to the interior of the tomb, and all three communities celebrate the Divine Liturgy or Holy Mass there daily. It is also used for other ceremonies on special occasions, such as the Holy Saturday ceremony of the Holy Fire led by the Greek Orthodox Patriarch (with the participation of the Coptic and Armenian patriarchs). To its rear, in a chapel constructed of iron latticework, lies the altar used by the Coptic Orthodox. Historically, the Georgians also retained the key to the Aedicule. From May 2016 to March 2017, the Aedicule underwent restoration and repairs after the Israel Antiquities Authority declared the structure unsafe. Much of the $3 million project was funded by the World Monuments Fund. West of the Aedicule, to the rear of the Rotunda, is the Syriac Chapel with Tomb of Joseph of Arimathea, located in a Constantinian apse and containing an opening to an ancient Jewish rock-cut tomb. This chapel is where the Syriac Orthodox celebrate their Liturgy on Sundays. To the right of the sepulchre on the northwestern edge of the Rotunda is the Chapel of the Apparition, which is reserved for Roman Catholic use. On the east side opposite the Rotunda is the Crusader structure housing the main altar of the Church, today the Greek Orthodox catholicon. The main dome is 19.8 metres (65 ft) in diameter. The second, smaller dome sits directly over the centre of the transept crossing of the choir where the compas, an omphalos once thought to be the center of the world (associated with the site of the Crucifixion and the Resurrection), is situated. Since 1996 this dome is topped by the monumental Golgotha Crucifix which the Greek Patriarch Diodoros I of Jerusalem consecrated. It was at the initiative of Gustav Kühnel to erect a new crucifix at the Church of the Holy Sepulchre in Jerusalem that would not only be worthy of the singularity of the site, but that would also become a symbol of the efforts of unity in the community of Christian faith. East of this is a large iconostasis demarcating the Orthodox sanctuary before which is set the throne of the Greek Orthodox Patriarch of Jerusalem on the south side facing the throne of the Greek Orthodox Patriarch of Antioch on the north side. The chapels in the ambulatory are, from north to south: the Prison of Christ, the Greek Chapel of Saint Longinus, the Armenian Chapel of Division of Robes, the entrance to the Chapel of Saint Helena, and the Greek Chapel of the Derision. In the northeast side of the complex there is the Prison of Christ, alleged by the Franciscans to be where Jesus was held. The Greek Orthodox allege that the real place that Jesus was held was the similarly named Prison of Christ in their Monastery of the Praetorium, located near the Church of Ecce Homo between the Second and Third Stations of the Via Dolorosa. The Armenians regard a recess in the Monastery of the Flagellation at the Second Station of the Via Dolorosa as the Prison of Christ. A cistern among the ruins beneath the Church of St. Peter in Gallicantu on Mount Zion is also alleged to have been the Prison of Christ. To reconcile the traditions, some allege that Jesus was held in the Mount Zion cell in connection with his trial by the Jewish High Priest, at the Praetorium in connection with his trial by the Roman governor Pilate, and near the Golgotha before crucifixion. Chapel of Saint Helena – between the Chapel of Division of Robes and the Greek Chapel of the Derision are stairs descending to the Chapel of Saint Helena. Chapel of Vartan (or Vardan) Mamikonian – on the north side of the Chapel of Saint Helena is an ornate wrought iron door, beyond which a raised artificial platform affords views of the quarry, and which leads to the Chapel of Saint Vartan. The latter chapel contains archaeological remains from Hadrian's temple and Constantine's basilica. These areas are open only on request. Chapel of the Invention of the Holy Cross – another set of 22 stairs from the Chapel of Saint Helena leads down to the Roman Catholic Chapel of the Invention of the Holy Cross, believed to be the place where the True Cross was found. The Franciscan Chapel of St. Mary Magdalene – The chapel indicates the place where Mary Magdalene met Jesus after his resurrection. The Franciscan Chapel of the Blessed Sacrament (or Chapel of the Apparition) – in memory of Jesus' meeting with his mother after the Resurrection. The Syriac Orthodox Chapel of Saint Joseph of Arimathea and Saint Nicodemus. On Sundays and feast days it is furnished for the celebration of Mass. It is accessed from the Rotunda, by a door west of the Aedicule. On the far side of the chapel is the low entrance to an almost complete 1st-century Jewish tomb, initially holding six kokh-type funeral shafts radiating from a central chamber, two of which are still exposed. Although this space was discovered relatively recently and contains no identifying marks, some believe that Joseph of Arimathea and Nicodemus were buried here. Since Jews always buried their dead outside the city, the presence of this tomb proves that the Holy Sepulchre site was outside the city walls at the time of the crucifixion. South of the Aedicule is the "Place of the Three Marys", marked by a stone canopy and a large modern wall mosaic. From here one can enter the Armenian monastery which stretches over the ground and first upper floor of the church's southeastern part. The Sultan's firman (decree) of 1853, known as the "Status Quo", pinned down the now permanent statutes of property and the regulations concerning the roles of the different denominations and other custodians. The primary custodians are the Greek Orthodox, Armenian Apostolic, and Roman Catholic Churches, with the Greek Orthodox Church having the lion's share. In the 19th century, the Coptic Orthodox, the Ethiopian Orthodox and the Syriac Orthodox acquired lesser responsibilities, which include shrines and other structures in and around the building. Times and places of worship for each community are strictly regulated in common areas. Greek Orthodox act through the Greek Orthodox Patriarchate as well as through the Brotherhood of the Holy Sepulchre. Roman Catholics act through the Franciscan Custody of the Holy Land. The establishment of the 1853 status quo did not halt controversy and occasional violence. On a hot summer day in 2002, a Coptic monk moved his chair from its agreed spot into the shade. This was interpreted as a hostile move by the Ethiopians and eleven were hospitalized after the resulting fracas. In another incident in 2004, during Orthodox celebrations of the Exaltation of the Holy Cross, a door to the Franciscan chapel was left open. This was taken as a sign of disrespect by the Orthodox and a fistfight broke out. Some people were arrested, but no one was seriously injured. On Palm Sunday, in April 2008, a brawl broke out when a Greek monk was ejected from the building by a rival faction. Police were called to the scene but were also attacked by the enraged brawlers. On Sunday, 9 November 2008, a clash erupted between Armenian and Greek monks during celebrations for the Feast of the Cross. A less grave sign of this state of affairs is located on a window ledge over the church's entrance. A wooden ladder was placed there at some time before 1852, when the Status Quo defined both the doors and the window ledges as common ground. This ladder, the "Immovable Ladder", in its latest incarnation, remains to this day, in almost exactly the same position it occupied in century-old photographs and engravings, as it must be replaced whenever it falls apart. An engraving by David Roberts in 1839 also shows the same ladder in the same position. No one controls the main entrance. In 1192, Saladin assigned door-keeping responsibilities to the Muslim Nuseibeh family. The wooden doors that compose the main entrance are the original, highly carved doors. The Joudeh Al-Goudia family were entrusted as custodian to the keys of the Holy Sepulchre by Saladin in 1187. Despite occasional disagreements, religious services take place in the Church with regularity and coexistence is generally peaceful. An example of concord between the Church custodians is the full restoration of the Aedicule from 2016 to 2017. In late February 2018 after a tax dispute over 152 million euros of uncollected taxes on church properties the Church was closed until further notice. The city hall stressed that the Church of the Holy Sepulchre and all other churches are exempt from the taxes, with the changes only affecting establishments like "hotels, halls and businesses" owned by the churches. NPR had reported that the Greek Orthodox Church calls itself the second-largest landowner in Israel, after the Israeli government. a discriminatory and racist bill that targets solely the properties of the Christian community in the Holy Land ... This reminds us all of laws of a similar nature which were enacted against the Jews during dark periods in Europe. The stated aim of the bill is to protect homeowners against the possibility that private companies will not extend their leases of land on which their houses or apartments stand. Jerusalem after being rebuilt by Hadrian. Two main east-west roads were built rather than the typical one, due to the awkward location of the Temple Mount, blocking the central east-west route. The site of the Church had been a temple to Jupiter or Venus before Constantine's edifice was built. Hadrian's temple had actually been located there because it was the junction of the main north-south road with one of the two main east-west roads and directly adjacent to the forum (which is now the location of the (smaller) Muristan); the forum itself had been placed, as is traditional in Roman towns, at the junction of the main north-south road with the (other) main east-west road (which is now El-Bazar/David Street). The temple and forum together took up the entire space between the two main east-west roads (a few above-ground remains of the east end of the temple precinct still survive in the Alexander Nevsky Church complex of the Russian Mission in Exile). From the archaeological excavations in the 1970s, it is clear that construction took over most of the site of the earlier temple enclosure and that the Triportico and Rotunda roughly overlapped with the temple building itself; the excavations indicate that the temple extended at least as far back as the Aedicule, and the temple enclosure would have reached back slightly further. Virgilio Canio Corbo, a Franciscan priest and archaeologist, who was present at the excavations, estimated from the archaeological evidence that the western retaining wall of the temple itself would have passed extremely close to the east side of the supposed tomb; if the wall had been any further west any tomb would have been crushed under the weight of the wall (which would be immediately above it) if it had not already been destroyed when foundations for the wall were made. Other archaeologists have criticized Corbo's reconstructions. Dan Bahat, the former city archaeologist of Jerusalem, regards them as unsatisfactory, as there is no known temple of Aphrodite (Venus) matching Corbo's design, and no archaeological evidence for Corbo's suggestion that the temple building was on a platform raised high enough to avoid including anything sited where the Aedicule is now; indeed Bahat notes that many temples to Aphrodite have a rotunda-like design, and argues that there is no archaeological reason to assume that the present rotunda was not based on a rotunda in the temple previously on the site. The New Testament describes Jesus's tomb as being outside the city wall, as was normal for burials across the ancient world, which were regarded as unclean. Today, the site of the Church is within the current walls of the old city of Jerusalem. It has been well documented by archaeologists that in the time of Jesus, the walled city was smaller and the wall then was to the east of the current site of the Church. In other words, the city had been much narrower in Jesus' time, with the site then having been outside the walls; since Herod Agrippa (41–44) is recorded by history as extending the city to the north (beyond the present northern walls), the required repositioning of the western wall is traditionally attributed to him as well. The area immediately to the south and east of the sepulchre was a quarry and outside the city during the early 1st century as excavations under the Lutheran Church of the Redeemer across the street demonstrated. The church is a part of the UNESCO World Heritage Site Old City of Jerusalem. The Christian Quarter and the (also Christian) Armenian Quarter of the Old City of Jerusalem are both located in the northwestern and western part of the Old City, due to the fact that the Holy Sepulchre is located close to the northwestern corner of the walled city. The adjacent neighbourhood within the Christian Quarter is called the Muristan, a term derived from the Persian word for hospital—Christian pilgrim hospices have been maintained in this area near the Holy Sepulchre since at least the time of Charlemagne. From the 9th century, the construction of churches inspired in the Anastasis was extended across Europe. One example is Santo Stefano in Bologna, Italy, an agglomeration of seven churches recreating shrines of Jerusalem. Several churches and monasteries in Europe, for instance, in Germany and Russia, and at least one church in the United States have been modeled on the Church of the Resurrection, some even reproducing other holy places for the benefit of pilgrims who could not travel to the Holy Land. They include the Heiliges Grab of Görlitz, constructed between 1481 and 1504, the New Jerusalem Monastery in Moscow Oblast, constructed by Patriarch Nikon between 1656 and 1666, and Mount St. Sepulchre Franciscan Monastery built by the Franciscans in Washington, DC in 1898. ^ The walled Old City area is contested by the State of Palestine, but the power over the region is de facto exercised by the State of Israel since conquering it from Jordan in 1967. ^ In American English also spelled Sepulcher. Also called the Basilica of the Holy Sepulchre. ^ a b English aedicule or edicule, the Latin diminutive of aedes, "house", meaning "small house" or "shrine"
^ "Complete compendium of Church of the Holy Sepulchre". Madain Project. Retrieved 18 March 2018. McMahon, Arthur L. (1913). "Holy Sepulchre" . In Herbermann, Charles. Catholic Encyclopedia. New York: Robert Appleton Company. ^ a b c "Church of the Holy Sepulchre, Jerusalem". Jerusalem: Sacred-destinations.com. 21 February 2010. Retrieved 7 July 2012. ^ a b Stephenson, Paul (2010). Constantine: Roman Emperor, Christian Victor. The Overlook Press. p. 206. ISBN 978-1-46830-300-1. ^ Rudd, Steve. "The Temple in Jerusalem over the threshing floor which is presently under the Al Kas fountain". Bible.ca. Retrieved 29 November 2018. ^ a b c Owen, G. Frederick, ed. (1983) . The Thompson Chain-Reference Bible (Fourth improved (updated) ed.). Indianapolis: B.B. Kirkbride Bible Co. p. 323 (appendix). ^ NPNF2-01. Eusebius Pamphilius: Church History, Life of Constantine, Oration in Praise of Constantine. Christian Classics Ethereal Library. 13 July 2005. Retrieved 19 September 2014. Then indeed did this most holy cave present a faithful similitude of his return to life, in that, after lying buried in darkness, it again emerged to light, and afforded to all who came to witness the sight, a clear and visible proof of the wonders of which that spot had once been the scene, a testimony to the resurrection of the Saviour clearer than any voice could give. ^ Renner, Gerald (14 December 1996). "IS IT THE TOMB OF CHRIST? A SEARCH FOR EVIDENCE". Hartford Courant. Retrieved 29 November 2018. ^ "Commemoration of the Founding of the Church of the Resurrection (Holy Sepulchre) at Jerusalem". Orthodox Church in America. Retrieved 2 March 2012. ^ Kroesen, Justin (2000). The Sepulchrum Domini Through the Ages: Its Form and Function. Leuven. p. 11. ISBN 9789042909526 – via WorldCat, Google Books. ^ Bokenkotter, Thomas (2004). A Concise History of the Catholic Church. Doubleday. p. 155. ISBN 0-385-50584-1. ^ MacCulloch, Diarmaid (2009-09-24). A History of Christianity: The First Three Thousand Years. Penguin Books Limited. p. 1339. ISBN 9780141957951. ^ a b c Lev, Yaacov (July 1991). State and Society in Fatimid Egypt. Leiden; New York: E.J. Brill. p. 40. ISBN 978-90-04-09344-7. (Subscription required (help)). ^ Foakes-Jackson, Frederick John (1921). An Introduction to the History of Christianity, A.D. 590–1314. London: Macmillan. ^ Fergusson, James (1865). A History of Architecture in All Countries. London: J. Murray. ^ Gold, Dore (29 January 2007). The Fight for Jerusalem: Radical Islam, the West, and the Future of the Holy City. Washington, D.C.: Regnery Publishing. ISBN 1-59698-029-X. ^ a b c Pilgrimages and Pilgrim shrines in Palestine and Syria after 1095, Henry L. Savage, A History of the Crusades: The Art and Architecture of the Crusader States, Volume IV, ed. Kenneth M. Setton and Harry W. Hazard, (University of Wisconsin Press, 1977), 37. ^ Pringle, Denys (1993). The Churches of the Crusader Kingdom of Jerusalem: Volume 3, The City of Jerusalem: A Corpus. Cambridge University Press. pp. 31–32. ISBN 978-0-521-39038-5. ^ a b Romey, Kristin (31 October 2016). "Jesus' Burial Tomb Uncovered: Here's What Scientists Saw Inside". National Geographic. Retrieved 2 July 2018. ^ a b c Murphy-O'Connor, Jerome (February 1998). The Holy Land. Oxford University Press. pp. 56, 59. ISBN 978-0191528675. ^ Mailáth, János Nepomuk Jozsef (1848). Geschichte der europäischen Staaten, Geschichte des östreichischen Kaiserstaates [History of the European states, history of Austrian Imperial State]. 4. Hamburg: F. Perthes. p. 262. ^ Cohen, Raymond (May 2009). "The Church of the Holy Sepulchre: A Work in Progress". The Bible and Interpretation. Retrieved 2014-09-19. ^ Romey, Kristin (26 October 2016). "Exclusive: Christ's Burial Place Exposed for First Time in Centuries". National Geographic. Retrieved 30 October 2016. ^ a b Warren, E.K. ; Hartshorn, W.N. ; McCrillis, A.B. (1905). Glimpses of Bible Lands: The Cruise of the Eight Hundred to Jerusalem. Boston, MA: The Central Committee. p. 174. ^ Hesemann, Michael (1999). Die Jesus-Tafel (in German). Freiburg. p. 170. ISBN 3-451-27092-7. ^ a b Lancaster, James E. (1998). "Finding the Keys to the Chapel of St. Vartan". Jim Lancaster's Web Space. Retrieved 2 March 2012. the height difference can be easily seen; the yellowish wall on the left is the 4th century wall, the pinkish wall on the right is the 2nd century wall. ^ Metaxas, Eric (18 November 2016). "History Revealed? Jesus's Tomb Discovered in Church of the Holy Sepulchre, Empty". CNSNews.com. ^ a b Romey, Kristin (31 October 2016). "Unsealing of Christ's Reputed Tomb Turns Up New Revelations". National Geographic. Retrieved 1 November 2016. ^ Pappas, Stephanie (31 October 2016). "Original Bedrock of Jesus' Tomb Revealed in New Images". Live Science. Retrieved 1 November 2016. ^ "Parvis and Entry". Gerusalemme San Salvatore Convento Francescano St. Saviour's Monastery. Retrieved 2 July 2018. ^ LoLordo, Ann (28 June 1999). "Trouble in a holy place". The Baltimore Sun. Retrieved 2014-09-19. ^ a b c d e f g DK 2016, p. 98. ^ "The Brotherhood of the Holy Sepulcher". Greek Orthodox Patriarchate of Jerusalem. Archived from the original on 24 May 2008. Retrieved 2014-09-19. ^ DK 2016, p. 104. ^ Kaitholil.com (2018-12-28). Inside the church of the holy sepulchre in Jerusalem. YouTube. Retrieved 2018-12-28. ^ "Miracle of Holy Fire which happens every year". Holyfire.org. Retrieved 2 March 2012. ^ "Coptic Chapel". Church of the Holy Sepulchre. 15 December 2016. Retrieved 24 February 2019. ^ Janin, Raymond (1913). Échos d'Orient [Echos of the Orient]. 16. Institut français d'études byzantines. p. 35. ^ DeSandoli, Sabino (1986). The Church of Holy Sepulchre: Keys, Doors, Doorkeepers. Franciscian Press. p. 47. ^ Jeffery, George (1919). A Brief Description of the Holy Sepulchre Jerusalem and Other Christian Churches in the Holy City: With Some Account of the Medieval Copies of the Holy Sepulchre Surviving in Europe. Cambridge University Press. p. 69. Retrieved 2014-09-19. ^ Goldman, Russell (22 March 2017). "Tomb of Jesus Reopens to Public After $3 Million Restoration". The New York Times. Retrieved 23 March 2017. ^ "Catholic Chapel of the Apparition". See The Holy Land.net. Retrieved 2018-04-18. ^ "The Cross of Golgotha". Michael Hammers. 24 June 2014. Retrieved 2014-09-19. ^ Terry Trainor. "Bedlam. St. Mary of Bethlehem". p. 32. Retrieved 2018-10-24. ^ "Chapel of Saint Helena". Holyland. Archived from the original on 15 March 2012. Retrieved 3 March 2019. ^ Goldhill, Simon (2009). Jerusalem, City of Longing. p. 35. ^ "Chapel of St. Helena". www.holysepulchre.custodia.org. Retrieved 2018-02-03. 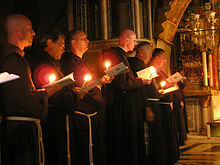 ^ a b "The Franciscans at the Holy Sepulchre". The Franciscans of the Holy Land. Retrieved 2 March 2012. ^ "Chapel of Joseph of Arimateaitled". Church of the Holy Sepulchre-Hours,History,Facts,Pictures. ^ Michael., Dumper,; E., Stanley, Bruce (2007-01-01). Cities of the Middle East and North Africa : a historical encyclopedia. ABC-CLIO. ISBN 9781576079195. OCLC 80014324. ^ Armstrong, Chris (1 July 2002). "Christian History Corner: Divvying up the Most Sacred Place". Christianity Today. Retrieved 2 March 2012. ^ Fisher-Ilan, Allyn (28 September 2004). "Punch-up at tomb of Jesus". The Guardian. London. Retrieved 2014-09-19. ^ El Deeb, Sarah (21 April 2008). "Christians brawl at Jesus' tomb". San Francisco Chronicle. Associated Press. Retrieved 2014-09-19. ^ "Riot police called as monks clash in the Church of the Holy Sepulchre". The Times. London. 10 November 2008. Retrieved 2014-09-19. (Subscription required (help)). ^ O'Laughlin, Toni (10 November 2008). "The monks who keep coming to blows in Jerusalem". The Guardian. Retrieved 2014-09-19. ^ "Holy Sepulchre Ladder". Coastdaylight.com. Retrieved 7 July 2012. ^ "Entrance to the holy sepulchre; title page, vol. 1". Library of Congress. 1842. Retrieved 2014-09-19. ^ Sherwood, Harriet (21 March 2017). "Jesus's tomb unveiled after $4m restoration". The Guardian. Manchester. Retrieved 2 July 2018. ^ "Church at Jesus's burial site closed for second day after tax dispute". i24NEWS. 26 February 2018. ^ Estrin, Daniel (2 December 2017). "Greek Orthodox Church Sells Land In Israel, Worrying Both Israelis And Palestinians". Weekend Edition. ^ a b Token, Benny (27 February 2018). "בעיריית ירושלים לא מתרגשים מהכנסייה" [The Jerusalem Municipality is not moved by the church]. Arutz Sheva (in Hebrew). Retrieved 2 July 2018. ^ a b "WATCH: Pilgrims Face Closed Doors at Church of the Holy Sepulchre". The Jerusalem Post. Reuters. 26 February 2018. Retrieved 2 July 2018. ^ "Church of the Holy Sepulcher". Generation Word. Retrieved 31 May 2018. ^ Bahat, Dan (May–June 1986). "Does the Holy Sepulchre Church Mark the Burial of Jesus?". Biblical Archaeology Review. Retrieved 2014-09-19. (Subscription required (help)). ^ Toynbee, Jocelyn M. C. Death and Burial in the Roman World, pp. 48–49, JHU Press. 1996. ISBN 0-8018-5507-1. An exception in the Classical World were the Lycians of Anatolia. There are also the Egyptian mortuary-temples, where the object of worship was the deified royal person entombed, but Egyptian temples to the major gods contained no burials. ^ Trainor, Terry (21 May 2012). Bedlam. St. Mary of Bethlehem. Trainor, Terry. ISBN 9781471714283. ^ Monastero di Santo Stefano: Basilica Santuario Santo Stefano: Storia, Bologna. Jerusalem, Israel, Petra & Sinai. DK. 2016 . ISBN 978-1-4654-4131-7. Biddle, Martin (25 February 1999). The Tomb of Christ. Scarborough: Sutton Publishing. ISBN 0-7509-1926-4. Biddle, Martin; Seligman, Jon; Tamar, Winter & Avni, Gideon (7 July 2000). The Church of the Holy Sepulchre. New York: Rizzoli in cooperation with Israel Antiquities Authority, distributed by St. Martin's Press. ISBN 0-8478-2282-6. Coüasnon, Charles (1974). The Church of the Holy Sepulchre in Jerusalem. London: Oxford University Press for the British Academy. ISBN 0-19-725938-3. Gibson, Shimon; Taylor, Joan E. (1994). Beneath the Church of the Holy Sepulchre Jerusalem: The archaeology and early history of traditional Golgotha. London: Committee of the Palestine Exploration Fund. ISBN 0-903526-53-0. Cohen, Raymond (10 March 2008). Saving the Holy Sepulchre: How Rival Christians Came Together to Rescue Their Holiest Shrine. Oxford University Press. ISBN 0-19-518966-3. (Subscription required (help)). Bowman, Glenn (16 September 2011). ""In Dubious Battle on the Plains of Heav'n": The Politics of Possession in Jerusalem's Holy Sepulchre". University of Kent. Weitzmann, Kurt, ed. (1979). Age of spirituality: late antique and early Christian art, third to seventh century. New York: Metropolitan Museum of Art. ISBN 978-0870991790. Wikimedia Commons has media related to Church of the Holy Sepulchre. Kaitholil.com (2018-12-28). Inside the church of the holy sepulchre in Jerusalem. YouTube.